Expect more from your datacenter! CeraNet focuses on business clients. We aren’t just a data center. We offer solutions to your most complex IT problems. Because we do not accept mass / bulk email servers, spammers camfrog, streamers, chat, or port scanners / bots, our network is reliable, stable, and provides a fantastic platform for your business. Eliminating abuse on our network has eliminated issues with network slowdowns or instability, DDOS attacks, and outages. That makes CeraNet one of the most stable networks around. We offer risk free service with our 100% up-time guarantee backed by an industry leading Service Level Agreement (SLA). Special Promotion: Buy today and get $35 off your first month with FREE setup. If you pay for a year, get 2 free months and an additional 10% off! 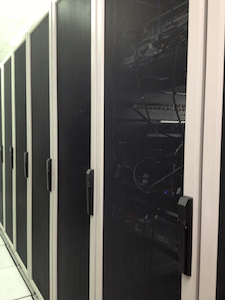 CeraNet has evolved into one of the premier facilities in the Columbus area through wise investments in our network infrastructure and data center facilities. We have the experience and resources to design and implement redundant UPS and generator power systems, HVAC, security protocols, and of course, a fully redundant IP network to ensure that we offer secure, reliable, and scalable services. Liebert, APC, Cisco, Dell, EMC, HP, and several other vendors provide access to dedicated SME resources to help with product and solution details. We can provision multiple GigE Ethernet or fiber connections to your equipment and terminate them in separate switch bays for internal network redundancy. Ceranet services local communities in Ohio such as Bexley, Upper Arlington, Whitehall, Lincoln Village, Grove City, Gahanna, Blacklick Estates, Worthington, Hilliard, Reynoldsburg, Dublin, Westerville, Pickerington, Pataskala, Delaware, Milo, Grandview Heights, Hanford, Steelton, Bexley, Shepard, Seagrave, Marble Cliff, Valley View, Bannon, Briggsdale, Upper Arlington, East Columbus, Linden, East Linden, Eastmoor, Doneys, and San Margherita as well as other major cities in OH such as Cincinnati, Akron, Toledo, and Cleveland. In addition to Columbus and surrounding areas, CeraNet has national and international clients and strives to provide the highest quality service possible.